Base Culture GF Sandwich Bread, 24 oz. Essential Baking Company GF Classic White Bread, 10oz. Essential Baking Company GF Multi-Grain Bread, 10oz. Essential Baking Company GF Cinnamon-Raisin Bread, 14 oz. Udi's Gluten Free Multigrain Bread, 12oz. 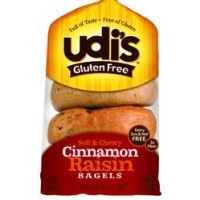 Udi's Gluten Free Cinnamon Raisin Bagel, 5ct. Food for Life Organic Ezekiel 4:9 Bread, 24oz. Food for Life Organic Ezekiel Cinnamon Raisin Bread, 24oz. Nature's Path Gluten Free Homestyle Frozen Waffles (6), 7.4oz. Van's GF Apple Cinnamon Waffles, 9oz. Van's GF Blueberry Waffles, 9oz. Cappello's GF Chocolate Chip Cookie Dough, 12oz. Zen Bakery Pumpkin Muffins, 4pk.